Easily add two USB 3.0 ports to your computer. Rosewill’s PCI-e USB 3.0 solution, the RC-505, provides ultra-fast data transfers at up to 5 Gbps to address the needs of higher performance connections between the PC and increasingly sophisticated peripherals. USB 3.0 is backward compatible with USB 1.0, 1.1, & 2.0 devices and is fully plug-n-play and hot swap compatible. The RC-505 is a great way to take advantage of the latest USB 3.0 data transfer technology. 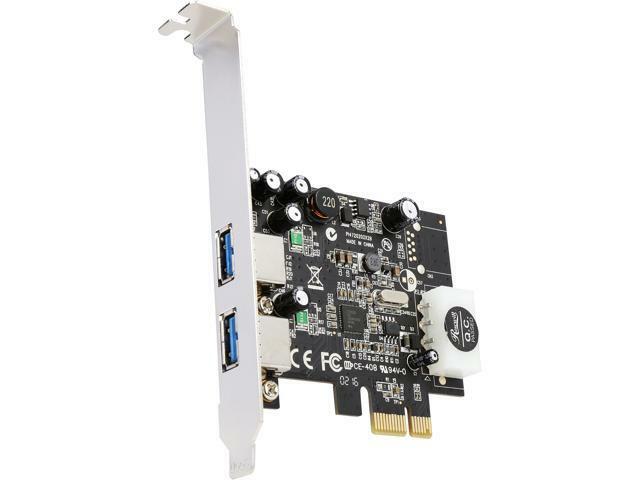 PCI Express USB 3.0 Solution The Rosewill RC-505 uses one free PCI Express slot to provide two USB 3.0 ports. With up to transfer rates 5 Gbps maximum, the RC-505 offers an ideal connection for digital cameras, scanners, printers, external CD / DVD / Blu-ray writers, hard disk drives, flash memory drives, etc. It is also backward compatible with USB 2.0 and USB 1.1 devices. The Rosewill RC-505 supports simultaneous operation of multiple USB 3.0, USB 2.0 and USB 1.1 devices. External Power Connector The RC-505 has a 4-pin power connector built-in for added power source to better support power hungry bus-powered devices. Windows 10 will find or use generic drivers automatically. If you updated the Windows from Windows 7 / 8 to Windows 10 and encountered issues, please follow the steps below. 3. Right click on it and left click on Uninstall. Check the box "Delete The Driver Software For This Device"
5. Once booted back into Windows 10, Windows will recognize the device and install the device using the built in drivers. It will appear as "Renesas USB 3.0 eXtensible Host Controller - 1.0 (Microsoft)" in Device Manager. Pros: The card works excellent. i installed a flash drive into the port and it responded in a flash. I would recommend this card. Cons: The only thing missing is the front 3.0 usb 19 pin header, but I knew that when I purchased it. The customer's case did not support a 3.0 usb, so no big deal. We are so sorry to hear that you received a defective item and we do understand your frustration. Based on your description, we are unable to determine the source of the defect. However, we are willing to help you with this. Please contact us with an electronic copy of order invoice and more information so that we will further check that for you. We will forward to your reply. Pros: - Been using it for 10 months with no issues. - It lets people with old computers like me utilize the USB 3.0 ports on my new case with the internal USB 3 hookup. Other Thoughts: - Fully recommended. Thank you for your purchase and feedback. We are really sorry to hear that the PCI-e card never worked. We are willing to help you with this with a replacement of the PCI-e card at our cost. Please contact us with an electronic copy of order invoice and we will further send the PCI-e card for you. We will look forward to your reply. Pros: I was getting close to 200MB/s on my external USB drives. Works with the standard Microsoft drivers. Cons: Died after only 5 months. We are really sorry to hear that the add on cards is not working and do understand your frustration; If the item is still within its 1-year manufacturer warranty, you could claim the warranty with your order invoice; we do care about your feedback and will continue improving our products in future. Pros: Have been slowly updating some of my computers to handle USB 3.0. Eventually............................it worked. Cons: Have this card and the Mailiya 3.0 card. The Mailiya card was super easy to install even with the baby cd. The Rosewill instructions said very clearly " Type d:\RC-505\Setup.exeCD had every driver EXCEPT the RC-505. Go figure; and it was $5 more expensive!!! Had to go to the website ! No more Roseville. Other Thoughts: How tough can they make upgrading a simple $20 card ? Sorry this any inconvenience. Please contact our customer service team to start RMA, you may get refund or replacement based on our RMA policy. Thank you very much for your business. Pros: -It worked for a while. -attractive matte black soldermask on the PCB. -not great speed, never got over 100 MB/s with any single or multiple HDD. A VIA chipset card that replaced this gets over 200 MB/s speeds (single drive >170 MB/s, multiple drives >200 MB/s). -Eventually a power supply chip on the board (the one above "Made in China" in the photos) died, going short circuit, sending 12 V instead of 5 V into the USB ports. Anything USB bus powered then promptly fried. Lost a really nice hub and a 2 TB external HDD. Other Thoughts: Even when it worked, it wasn't great, delivering less than stellar performance. When it died it took out other much more expensive devices with it. We strive to provide the best quality and service to you. Please contact our support team for your warranty options. Thank you.